We admit that we've always been a bit uneasy about the unabashed sincerity of local indie rock luminaries Mean Creek's music. It's really our own hang-up, and one not worth dwelling on here, and the eight-year-old act's hook-heavy new set Local Losers -- a collection of scruffy tunes whose swell and sweep subsumes years of FM ministrations of Bruce Springsteen, The Monkees and The 'Mats -- provides all the incentive anyone should need to enlist in the Creek Army. Local Losers arrives and departs with the economy of a major carrier's passenger jet, touching down with the fist-pumping, feedback-spangled howler "Cool Town," catching a smoke in the pilot's lounge along with "My Madeline" (whose woozy, bending guitar leads and invigorating harmonies make the tune an album highlight), flipping through magazines over a jumbo vodka tonic while some guy shouts in your ear about the Massachusetts border, and then going wheels up again with the dreamy, yearning closer "Teenage Feeling." That final tune finds fronter Chris Keene sounding particularly vulnerable, maybe even a little scared that the FAA might breech the cockpit and ask him to blow a breathalyzer. The album proceedings are thrillingly brisk (no song goes past the crucial three-minute mark, a calculus once tied to analog jukeboxes and full-flavor cigarettes, a metric that would seem to have outlasted both), richly melodic and persistently rewarding, and the cats over at Old Flame, who released Local Losers April 8, are likely feeling pretty smart right now. Mean Creek's set was issued in a limited edition of 300 LPs pressed to 45RPM 12" flat circles of vinyl [get it], as well as CD [boink] and digital download. Oh, right, that flyer up there... yeah, Mean Creek is having this totally epic release show Friday night in Cambridge, with a ridiculously stacked bill the very sight of which should induce queasiness and/or hyperventilation. When was the last time you saw heavyweights Pile, Ovlov and The Young Leaves all on one bill? We're looking forward to hearing new music from the lot of them, and particularly The Young Leaves, whose 2010 LP Life Underneath -- now available as a free download -- has recently gone back into heavy rotation at Clicky Clicky HQ. And Heliotropes, too? The Brooklyn-based fuzz docents are the wild card act for us, as we have no more than a passing familiarity with them, but, we mean, seriously: just look at that bill. Just look at it. 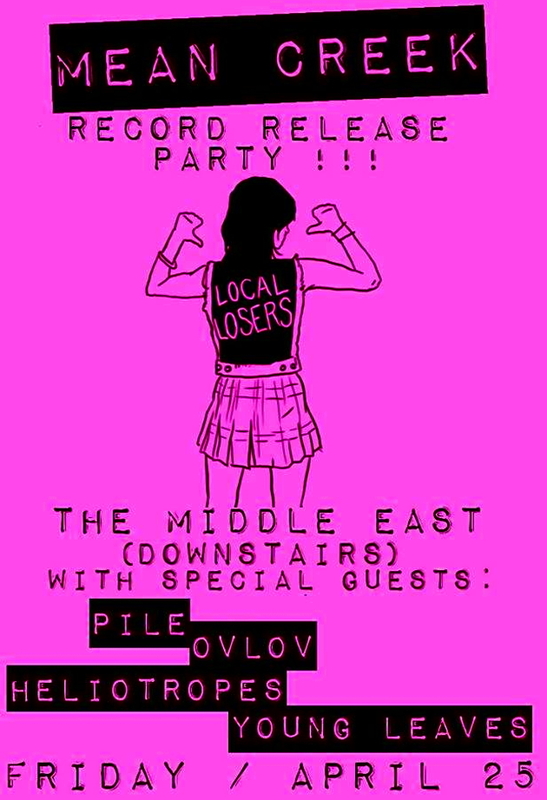 Here's the Facebook event page -- how about we leave you with some streams and we circle back up Friday night at the Middle East? It's the right thing to do and the tasty way to do it.